Two of the UK's biggest trade unions have revealed they are planning for co-ordinated strikes unless the government suspends its public sector pay freeze. Unison said it had "no doubt whatsoever" that action would go ahead if the coalition did not change its stance, while the GMB claimed people were "getting sick" of the situation. 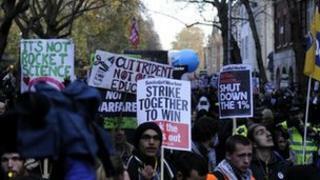 But TUC leader Brendan Barber said he did not envisage a "general strike". The government insists pay freezes are vital to cutting the deficit. The issue of pay is expected to dominate the TUC's annual Congress which is getting under way in Brighton. The organisation says wages in all sectors have not kept pace with economic growth over the past 30 years, with the average employee on a salary of £7,000 less than they would have been had this not been the case. In his June 2010 Budget speech, Chancellor George Osborne said he was "asking the public sector to accept a two-year pay freeze". And in the 2011 Autumn Statement, he announced that general pay rises would be restricted to 1% for a further two years. Media captionBrendan Barber: "People's living standards are being squeezed"
Public sector workers held strikes on 10 May and 30 November last year in protest against changes to pensions, with an estimated 1.5 million taking part in the latter. A TUC Congress motion proposed by the Public and Commercial Services Union calls for "further co-ordinated action" over pay. This comes after members of the NUT teaching union voted to back a strike over the "erosion" of pay and working conditions. At a press conference at the Brighton Centre, Unison general secretary Dave Prentis said: "I've no doubt whatsoever that, if we cannot talk to this government and negotiate agreement to end the pay freeze, it will lead to industrial action." He added that union members were "afraid" for their financial futures, with some "not buying clothes for their children" because of their circumstances. Mr Prentis also said: "If we cannot reach agreement with employers, we will move to ballot for industrial action." Negotiations over public sector pay generally take place between January and April, but Mr Prentis said planning for strikes was already under way. GMB general secretary Paul Kenny said: "It's time for politicians to treat public sector workers with respect, rather than slagging them off. There comes a point when people say they have had enough." He added: "People are getting sick of being treated as political footballs." Mr Kenny also told reporters: "We would co-ordinate [strike action] with any public sector union." Mr Barber, who is retiring as TUC general secretary at the end of this year, said people had been "cheated out of their fair share". He added that increasing wages would give workers more spending power and boost the wider economy. Mr Barber also said: "The austerity economics of this government fails to learn why the economy crashed. Ministers want to go back to business as usual, continuing to hold down the wages of ordinary employees." But he played down the prospect of further co-ordinated strike action, saying this would require "a very strong sense of anger and a democratic vote by the workers". Last week, Len McCluskey, the general secretary of the Unite union, also said he would support calls for strikes which could take place within months. Ministers say holding down public sector pay will save £3.3bn a year, which they argue is vital to reducing the budget deficit. The TUC's Congress runs until Wednesday. Other issues to be debated include reform of the banking system, youth unemployment and the future of UK aviation policy.